The scheme will be developed in conjunction with the Rex Group. The intention is to develop a two storey scheme with trade on the ground and either a health club or self storage at first floor. The scheme will also include a freestanding restaurant. Excellent location on the junction on Gunnels Wood Road and Broadhall Way. Specific requirements can be incorporated. The most prominent site in Stevenage, suitable for a gateway development. 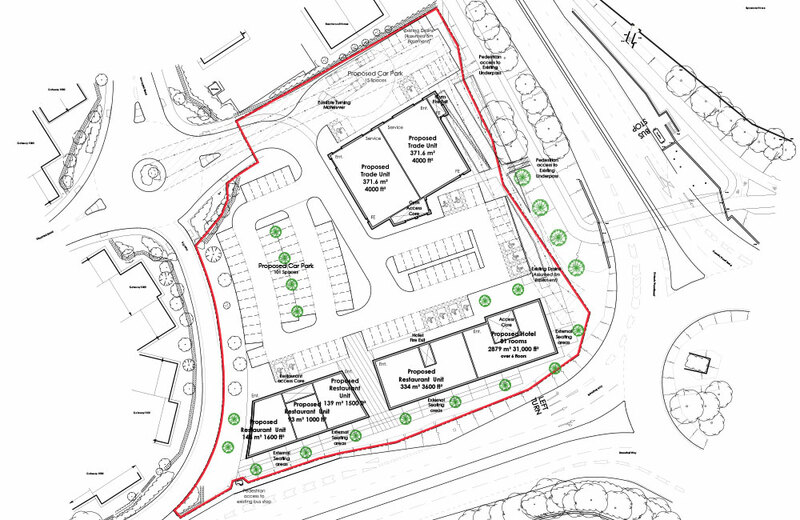 The current layout plan shows a two storey building with approximately 20,000 sqft of trade on the ground floor with a health club above in addition to a stand alone restaurant. However, at this stage other uses and configurations can be considered, from the Council’s perspective design is key and any development will need to be at least two storey. The site occupies possibly the most prominent location in Stevenage on the roundabout junction of Gunnels Wood Road and Broadhall Way (A602) the latter providing access to the A1(M). Gunnels Wood Road is the main main industrial area for the town also accommodating many main car dealerships. Both Roaring Meg and Monswood Retail Parks are within 0.25 miles of the site.